Western Mediterranean hydro-climatic consequences of Holocene ice-rafted debris (Bond) events Western Mediterranean hydro-climatic consequences of Bond events Christoph Zielhofer et al. Gerard C. Bond established a Holocene series of North Atlantic ice-rafted debris events based on quartz and haematite-stained grains recovered from subpolar North Atlantic marine cores. These so-called “Bond events” document nine large-scale and multi-centennial North Atlantic cooling phases that might be linked to a reduced thermohaline circulation. Regardless of the high prominence of the Holocene North Atlantic ice-rafted debris record, there are critical scientific comments on the study: the Holocene Bond curve has not yet been replicated in other marine archives of the North Atlantic and there exist only very few palaeoclimatic studies that indicate all individual Bond events in their own record. Therefore, evidence of consistent hydro-climatic teleconnections between the subpolar North Atlantic and distant regions is not clear. In this context, the Western Mediterranean region presents key hydro-climatic sites for the reconstruction of a teleconnection with the subpolar North Atlantic. In particular, variability in Western Mediterranean winter precipitation might be the result of atmosphere–ocean coupled processes in the outer-tropical North Atlantic realm. Based on an improved Holocene δ18O record from Lake Sidi Ali (Middle Atlas, Morocco), we correlate Western Mediterranean precipitation anomalies with North Atlantic Bond events to identify a probable teleconnection between Western Mediterranean winter rains and subpolar North Atlantic cooling phases. Our data show a noticeable similarity between Western Mediterranean winter rain minima and Bond events during the Early Holocene and an opposite pattern during the Late Holocene. There is evidence of an enduring hydro-climatic change in the overall Atlantic atmosphere–ocean system and the response to external forcing during the Middle Holocene. Regarding a potential climatic anomaly around 4.2 ka (Bond event 3) in the Western Mediterranean, a centennial-scale winter rain maximum is generally in-phase with the overall pattern of alternating “wet and cool” and “dry and warm” intervals during the last 5000 years. Zielhofer, C., Köhler, A., Mischke, S., Benkaddour, A., Mikdad, A., and Fletcher, W. J.: Western Mediterranean hydro-climatic consequences of Holocene ice-rafted debris (Bond) events, Clim. Past, 15, 463-475, https://doi.org/10.5194/cp-15-463-2019, 2019. Figure 1Geographical setting. (a) Positions of the stacked ice-rafted debris record (MC52 + VM29-191, Bond et al., 2001) and the improved Sidi Ali oxygen stable isotope record (this study). (b) Regional context of Lake Sidi Ali in the Moroccan Middle Atlas; arrows indicate impacts of different air masses on Holocene climate history. (c) Lake Sidi Ali; the yellow arrow shows the core position. Gerard C. Bond reconstructed a Holocene series of North Atlantic ice-rafting events (Bond et al., 1997, 2001) based on the numbers of counted quartz and haematite-stained grains in marine cores recovered from the subpolar North Atlantic (Fig. 1a). These so-called “Bond events” document nine (Fig. 3b) large-scale and multi-centennial North Atlantic cooling phases that might be linked to a reduced thermohaline circulation in the North Atlantic. Due to attested large-scale atmosphere–ocean-linked teleconnections, an increasing number of palaeoclimatologists relate Bond events with chronologically in-phase climatic anomalies all over the world. To this day, the paper about North Atlantic ice-rafted debris events (Bond et al., 2001) is one of the most-cited papers on the Holocene climate history (2756 citations, Google Scholar, 2019: https://scholar.google.de/scholar?hl=de&as_sdt=0\%2C5&q=Persistent+solar+influence+on+North+Atlantic+climate+during+the+Holocene&btnG). Regardless of the high prominence of the Holocene North Atlantic ice-rafted debris record, there are also numerous critical scientific comments on the study. 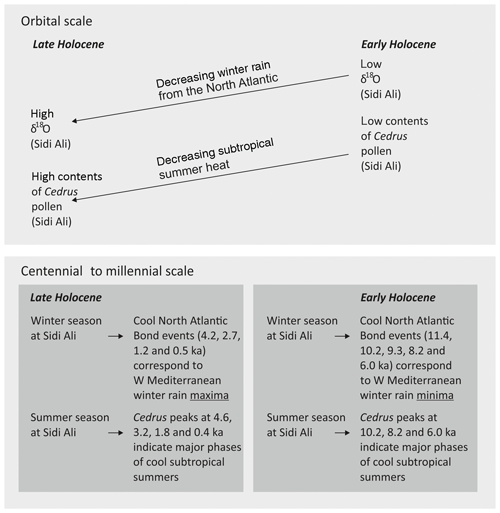 (a) As far as the authors are aware, the stacked Holocene Bond curve has not yet been replicated in other marine archives of the North Atlantic or could not be reconstructed (Bradley and Bakke, 2019). (b) Some marine geologists question whether sand grains in these marine cores represent lithological material transported by rafted icebergs (Sejrup et al., 2011). (c) Bond et al. (2001) postulated a quasiperiodic “1500-year” cycle in the Holocene ice-rafted debris record. However, a Holocene 1500-year cycle remains controversial in the scientific community (Darby et al., 2012; Obrochta et al., 2012). (d) The forcing mechanisms for the multi-centennial to millennial-scale ice-rafted debris events are not clear (Bügelmayer-Blaschek et al., 2016). (e) Furthermore, there exist only very few palaeoclimatic studies (Cheng et al., 2015; Smith et al., 2016) that indicate all individual Bond events in their own record. Therefore, evidence of consistent hydro-climatic teleconnections between the subpolar North Atlantic and distant regions is not clear for the entire Holocene. In this context, the Western Mediterranean region features key hydro-climatic sites for the reconstruction of a potential teleconnection with the subpolar North Atlantic. Beside indications of synchronous temperature changes in both regions (Català et al., 2018), Western Mediterranean variability in Holocene winter precipitation is the result of large-scale atmosphere–ocean coupled processes in the outer-tropical North Atlantic realm (Lamb et al., 1995; Trouet et al., 2009; Wassenburg et al., 2013, 2016; Zielhofer et al., 2017a). In addition to indications from continuous hydro-climatic archives, Western Mediterranean alluvial archives show a link with Bond events. Fluvial geomorphologists identify Holocene flood intervals that chronologically match with peaks in the ice-rafted debris record. This is the case for Western Mediterranean fluvial records in Morocco and Tunisia (Faust et al., 2004; Zielhofer and Faust, 2008; Zielhofer et al., 2010) but also for fluvial records in Western Mediterranean Europe (Benito et al., 2008, 2015a, b; Wolf et al., 2013). Furthermore, Western Mediterranean proxy data for prehistoric human occupation, such as 14C cumulative probability plots from archaeological databases, show a probable linkage with ice-rafted debris events (Zielhofer et al., 2008; Linstädter, 2016). Although many Western Mediterranean hydro-climatic records attest coincidences with Bond events, the forcing mechanisms and chronological correlations are not clear. (a) In the Western Mediterranean, multiple studies show that Holocene humidity changes are locally variable and of contrasting sign (Morellón et al., 2018). Whereas palaeoecological studies from the Pyrenees indicate environmental conditions that are more humid during Middle and Late Holocene North Atlantic cooling events (Pélachs et al., 2011), a prominent δ18O speleothem record from northern Spain (Smith et al., 2016) shows arid intervals. (b) Standard age errors of 14C and optically stimulated luminescence (OSL) dating techniques but also the non-continuous and non-linear deposition pattern of many terrestrial archives, such as flood deposits (Faust and Wolf, 2017) do not enable accurate age models and a direct synchronisation with Bond events. In a previous paper, we presented a stable oxygen isotope record of Holocene benthic ostracods from Lake Sidi Ali in the Middle Atlas, Morocco, that indicates multi-centennial to millennial intervals of Western Mediterranean winter rain minima during the last 12 000 years (Zielhofer et al., 2017a). Here, δ18O maxima correspond to winter rain minima. However, the mean chronological resolution of the previous stable oxygen isotope record is ∼130 years and only allows a limited comparison with palaeoecological proxy data from the same core. In the present paper, the chronological resolution of the Sidi Ali δ18O record is improved. We aim to compare the higher-resolution δ18O data with the published Cedrus pollen record from the same core (Campbell et al., 2017). The direct comparison of palaeo-hydrological and palaeoecological data from the same core enables a multi-proxy interpretation without age uncertainties that allows a better understanding of the Western Mediterranean hydro-climate history. Furthermore, we correlate for the first time the newly established Sidi Ali δ18O record with the North Atlantic ice-rafting debris record (Bond et al., 2001) to identify a probable teleconnection between Western Mediterranean winter rains and ocean–atmosphere coupled cooling phases in the subpolar North Atlantic. Finally, we provide an analysis of the Western Mediterranean hydro-climate during the 4.2 ka climatic event (Bond event) that is the focus of the present Climate of the Past special issue. The geographical position of the karstic Lake Sidi Ali in the Middle Atlas (33∘03′ N, 5∘00′ W; 2080 m a.s.l.) is within the mountainous desert margin of Morocco between the subhumid Mediterranean climate in the north and the arid Saharan climate in the south (Fig. 1b). The mean annual precipitation at Lake Sidi Ali is about 430 mm with a mean annual temperature of 10.3 ∘C (mean JJA maximum, 32.5 ∘C; mean DJF minimum, −8.4 ∘C) and a dry season lasting from June to September (Zielhofer et al., 2017b). The current hydro-climate at Sidi Ali is characterised by Atlantic cyclones during the winter season with a strong impact of the present-day North Atlantic Oscillation (NAO) providing more precipitation during NAO negative stages (Hurrell, 1995; Hurrell et al., 2003). In contrast, Mediterranean cyclones are associated more with rainfall during spring and autumn (Knippertz et al., 2003). The surrounding forest vegetation, consisting of evergreen oak (Quercus rotundifolia) and Atlantic cedar (Cedrus atlantica), is strongly degraded due to overgrazing. The lake lies within a closed basin of approximately 14 km2 and has a varying surface area between 2.0 and 2.8 km2 (Sayad et al., 2011). During late summer 2012, Lake Sidi Ali waters had δ18O values between +1.21 ‰ and +2.57 ‰ vs. Vienna Standard Mean Ocean Water (VSMOW), a surface temperature of 18.5 ∘C, and a lake bottom temperature of 8.7 ∘C. The surface δ18O values are higher than those of bottom waters, indicating the evaporative enrichment during summer stratification. At the deepest part of Lake Sidi Ali our research group conducted a drilling campaign in September 2012 (Fig. 1c). A 19.56 m sequence from a single borehole was recovered using a UWITEC piston corer. The sediments consist of faintly laminated, organic silts with some aquatic macrofossils including ostracods. The sequence is continuous without any hiatus (Zielhofer et al., 2017a). Our Bayesian age model is based on 26 accelerator mass spectrometry (AMS) 14C dates on pollen concentrates and terrestrial plant remains and 210Pb and 137Cs radiometric dating (Fletcher et al., 2017). The age model reveals a coherent robust chronology, which provides a continuous record for the last 12 000 years (Fig. S1 in the Supplement). Figure 2Western Mediterranean (Sidi Ali) winter rain and Cedrus records versus a subtropical summer temperature record. (a) Improved Holocene Sidi Ali δ18O record from closely related species Fabaeformiscandona sp. and Candona sp. (Zielhofer et al., 2017a and this study). The grey line represents the original data. The black line shows results of a low-pass filter (1000 years) removing centennial to multi-centennial variability. Red numbers indicate major dry winter phases in the Western Mediterranean. (b) Sidi Ali Cedrus pollen record (Campbell et al., 2017). The black line shows results of a low-pass filter (1000 years). (c) Summer sea surface temperature (SST) at Hole 658C (deMenocal et al., 2000). The grey line represents the original data. The black line shows results of a low-pass filter (1000 years). Olive numbers and pale olive bars indicate synchronous phases of summer cooling in the Middle Atlas (Sidi Ali) and reduced summer SST in the subtropical North Atlantic. We add 82 new samples of adult ostracod shell material from the closely related species Fabaeformiscandona sp. and Candona sp. to improve the chronological resolution of the previous oxygen isotope record (Zielhofer et al., 2017a). For ostracod sampling, 8 g dry sediment was freeze-dried and treated with 3 % H2O2. Afterwards, the samples were wet-sieved with a mesh size of 250 µm. The residues were dried at 50 ∘C. Then, ostracod shells were picked under a binocular microscope. Four to six adult shells (about 20 µg) were used for oxygen isotope analyses. Shells were reacted with 105 % phosphoric acid at 70 ∘C using a Kiel IV online carbonate preparation line connected to a MAT 253 mass spectrometer. Reproducibility was checked by replicate analysis of NBS19 and was better than ±0.06 ‰ (1σ) for δ18O values. Age estimates for the new oxygen isotope data (vs. Vienna Pee Dee Belemnite, VPDB) were extracted from the existing Sidi Ali age model (Fletcher et al., 2017). Further, we apply 1000- and 500-year low-pass filters (programme PAST) that reduce centennial-scale variabilities of the proxy records. The improved Sidi Ali δ18O record (grey lines in Figs. 2a and 3d) consists of 168 data points for the last 12 000 years and provides a mean chronological resolution of 71.4 years. The chronological frame encompasses the entire Holocene and the last 300 years of the Late Glacial. Due to the scattering of the original data, 1000- and 500-year low-pass filters were applied (black lines in Figs. 2a and 3d) for a better visualisation of the millennial and multi-centennial trends. In consideration of present δ18O values and temperatures of Lake Sidi Ali waters (Zielhofer et al., 2017a) and according to the equation of Kim and O'Neil (1997), carbonate formed in the modern Lake Sidi Ali waters should have δ18O values between +1.3 ‰ and +2.5 ‰. In contrast, carbonates formed in nearby freshwater springs and streams currently reveal much lower values between −9 ‰ and −6 ‰, indicating that the higher values in the lake waters are significantly affected by evaporation (Benkaddour et al., 2005; Zielhofer et al., 2017a). The computed δ18O values between +1.3 ‰ and +2.5 ‰ for carbonates in modern lake waters are slightly lower than the youngest δ18O value from Sidi Ali ostracod shells that attain +3.8 ‰ likely due to the vital offset of ostracod calcite in comparison to inorganic carbonate (von Grafenstein et al., 1999). The full ostracod record ranges from −1.1 ‰ to +8.1 ‰ (Fig. 2a). These δ18O values were always higher than the computed values of the current freshwater springs, providing evidence of a lake that was always a closed basin during the recorded period. We calculated additional δ18O values for carbonate precipitated from Sidi Ali in equilibrium with host water at specific temperature scenarios and depths using the equation by Kim and O'Neil (1997). As a result, the significantly wider range of Holocene δ18O values from ostracods (−1.1 ‰ to 8.1 ‰) shows that water temperature changes alone cannot explain past δ18O variability but changes in the precipitation / evaporation ratio must be considered as well. For more details, we refer the reader to Zielhofer et al. (2018b). Further, we calculated the potential effect of temperature-dependent stable isotope fractionation during the formation of carbonate in Sidi Ali water. As a result, multi-centennial δ18O changes could not have been higher than ca. 1 ‰ due to temperature changes. However, multi-centennial changes in the Sidi Ali δ18O signal are relatively large (more than 2 ‰, e.g. 8.2 ka). Therefore, the effect of temperature-dependent stable isotope fractionation is not large enough to explain these large changes. For more details, we refer the reader to Zielhofer et al. (2018b). In the Sidi Ali core, the filtered δ18O values increase from approximately +3 ‰ to +5 ‰ in the Early Holocene to values from +5 ‰ to +7 ‰ in the Late Holocene (Fig. 2a). As the most straightforward scenario for a subhumid, closed basin (Roberts et al., 2008), this implies a decrease in the precipitation / evaporation ratio with generally more arid conditions towards the Late Holocene. This corresponds to Sidi Ali diatom, total organic carbon (TOC) and carbonate records that indicate on average higher lake levels during the Early Holocene and lower levels at later stages (Zielhofer et al., 2017a). These findings seem to contradict the Cedrus pollen record from Lake Sidi Ali (Fig. 2b; Campbell et al., 2017), which shows a low or even missing occurrence of cedars during the Early Holocene, indicating reduced moisture availability at that time. However, reduced moisture availability for the cedar, which prefers a cool climate, seems to be the result of enhanced summer heat during the Early Holocene. Due to their shallow roots, cedars are vulnerable to summer heat in contrast to the deep-rooting evergreen oaks tolerant to warmth that dominate the Sidi Ali pollen record during the Early Holocene (Campbell et al., 2017). In this context, we attest summer temperature-driven drought stress and not winter precipitation as the limiting factor for the long-term trend of Holocene cedar occurrence in the Middle Atlas. This inference is in good agreement with the orbitally forced summer insolation maximum during the Early Holocene (Fig. 3f; Berger, 1978) and the chironomid-based summer temperature reconstructions that indicate enhanced Mediterranean summer temperatures during the Early Holocene as well (Samartin et al., 2017). 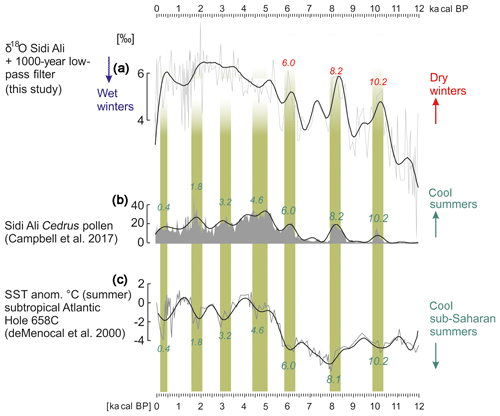 Following our interpretation, at an orbital scale our proxies show enhanced winter precipitation (low δ18O) and enhanced summer heat (low Cedrus pollen concentrations) during the Early Holocene and reduced winter precipitation (high δ18O) and cool summer conditions (high concentration of Cedrus pollen) during the Late Holocene (Fig. 4: orbital scale). We think that this is currently the best interpretation (Campbell et al., 2017), but alternatives may exist. Furthermore, we worked out that higher δ18O values might be also the result of a specific origin and seasonality of the precipitation-bearing air masses. We assume that Late Holocene precipitation from springtime Mediterranean cyclones reveals higher δ18O values than Atlantic winter rains (Zielhofer et al., 2017a). This growing season precipitation would also be favourable for Cedrus trees, further helping to explain the apparent contradiction between the long-term trend for the two proxies. The 1000-year low-pass-filtered Sidi Ali δ18O record displays noticeable millennial peaks for the last 12 000 years (Fig. 2a). During the Early and first half of the Middle Holocene, bi-millennial δ18O maxima correspond to occurrences of Cedrus pollen (Fig. 2b; Campbell et al., 2017), this is the case at 10.2, 8.2 and 6.0 ka cal BP. 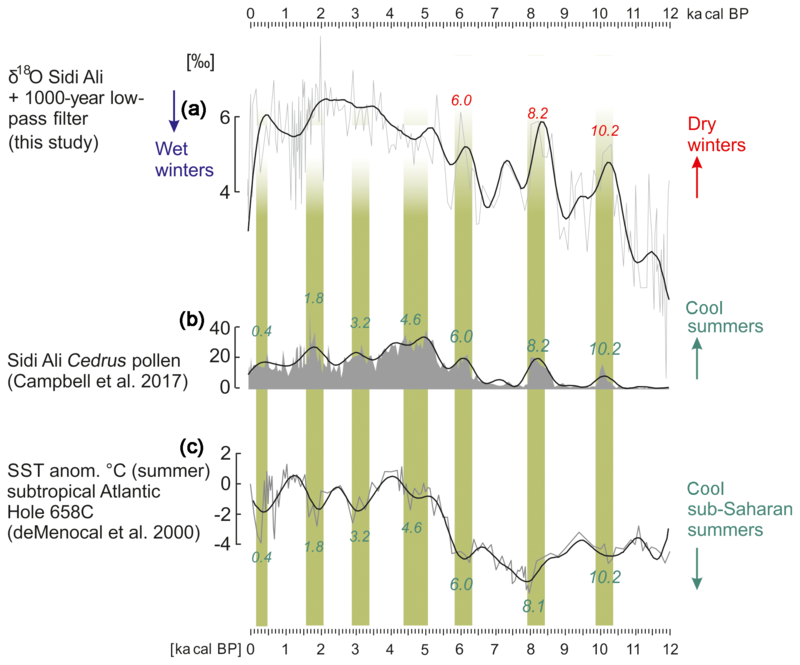 Whereas increased δ18O maxima indicate reduced winter rain, synchronous increases in Cedrus pollen are the result of enhanced moisture availability during summer. However, the orbital pattern between Sidi Ali δ18O and Cedrus is not generally visible in the comparison of δ18O and Cedrus records at millennial timescales. We argue that the Cedrus record is influenced by summer heat stress and that summer heat might be predominantly forced by the subtropical high and not by North Atlantic air masses. This is visible in the in-phase pattern between subtropical summer sea surface temperature (SST; Fig. 2c; deMenocal et al., 2000) and our Cedrus record at millennial timescales (olive bars in Fig. 2). In contrast, reduced summer heat (“cooling” at Sidi Ali) can be in-phase with reduced winter rainfall at Sidi Ali (e.g. 10.2, 8.2 and 6.0 ka cal BP; Fig. 2a and b), but there are also indications of out-of-phase patterns (e.g. 9.3 and 7.3 ka cal BP and also during the Late Holocene; Figs. 2a, b and 4: centennial to millennial scale). Hence, this out-of-phase pattern might be influenced by different forcing mechanisms for summer cooling (subtropical high) and winter rain (North Atlantic winter cyclones). Figure 3Holocene North Atlantic ice-rafted debris record versus Western Mediterranean (Sidi Ali) winter rain record. (a) Total solar irradiance (ΔTSI; Steinhilber et al., 2009). (b) Holocene Bond events 0 to 8 derived from Bond et al. (1997, 2001). (c) Ice-rafted debris (IRD) record based on haematite-stained grains of stacked MC52 and VM29-191 cores from the subpolar North Atlantic (Bond et al., 2001); the black line shows results of a low-pass filter (500 years) removing centennial variability. (d) Improved Sidi Ali δ18O record from closely related species Fabaeformiscandona sp. and Candona sp. (Zielhofer et al., 2017a, and this study). The grey line represents the original data. The black line shows results of a low-pass filter (500 years). Blue/red numbers and pale blue/orange bars indicate North Atlantic cooling events and wet/dry winters in the Western Mediterranean. (e) Modelled ages with 2σ ranges (Fletcher et al., 2017). (f) Summer insolation (65∘ N, June; Berger, 1978) (note reversed axis). (g) Palaeo-NAO record (Olsen et al., 2012) with a 500-year low-pass filter. Following the line of argument above, peaks in the Sidi Ali δ18O curve are interpreted as North Atlantic-derived winter rain minima. This corresponds to noticeable parallels between the Sidi Ali δ18O curve and the prominent subpolar North Atlantic ice-rafted debris record (Bond et al., 2001) from stacked MC52 and VM29-191 marine cores (pale blue/orange bars in Fig. 3). The synchronous pattern supports the idea of a Holocene teleconnection between Western Mediterranean winter precipitation and North Atlantic cooling. We are not able to provide significant correlations between Sidi Ali δ18O and ice-rafted debris due to different resolutions and probable uncertainties in both age models. However, we applied 500-year low-pass filters for the Sidi Ali δ18O curve and the ice-rafted debris record (Fig. 3c and d), which indicate a good match between both records. Major peaks in the Early to Middle Holocene Sidi Ali δ18O curve coincide with maxima in the ice-rafted debris record (orange bars in Fig. 3). This is particularly evident at 11.4, 10.2, 9.3, 8.2 and 6.0 ka cal BP. As shown in Fig. 3b, these prominent peaks correspond to Bond events 8 to 4 (Bond et al., 1997, 2001). In contrast, there is a noticeable negative relationship between Western Mediterranean winter rain minima and the ice-rafted debris record during the Late Holocene. Here, low δ18O values coincide with peaks in the ice-rafted debris record (blue bars in Fig. 3). Major troughs in the Sidi Ali δ18O curve at 4.2, 2.7 and 1.2 ka cal BP and during the Little Ice Age (LIA) concur with Bond events 3 to 0 (Figs. 3b and 4: centennial to millennial scale). Hence, the compilation of our δ18O curve with the ice-rafted debris record reveals a hydro-climatic shift at ∼5 ka cal BP with multi-centennial intervals of Western Mediterranean winter rain minima and North Atlantic cooling during the Early and first half of the Middle Holocene and opposite phases of winter rain maxima and North Atlantic cooling during the last 5000 years. 4.3 Evidence of a 4.2 ka climatic event in the Western Mediterranean? Our paper is part of the Climate of the Past special issue that addresses the 4.2 ka climatic event and its probable global appearance. According to Weiss (2016), there is evidence of a 4.2–3.9 ka megadrought across the Mediterranean and western Asia that led to collapses of Early Bronze Age societies. The 4.2 ka climatic event might correspond to North Atlantic Bond event 3, and there exists an ongoing debate in the scientific community about the global extent of a cold, dry and dusty multi-centennial event at that time. Central European palaeoclimatic archives, such as the well-dated Spannagel Cave speleothems in the Central Alps provide evidence of a cold and winter-dry climate around 4.2 ka (Mangini et al., 2007; Fohlmeister et al., 2012). Furthermore, in central and southern Italy, many speleothems and pollen records indicate a cold and dry climate around 4.2 ka (Margaritelli et al., 2016; Zanchetta et al., 2016; Di Rita and Magri, 2019). However, Western Mediterranean palaeo-environmental archives do not show uniform climatic patterns around 4.2 ka (Bini et al., 2018), although multiple studies report an arid interval at that time: in northeastern Spain a prominent speleothem record indicates cold and dry conditions around 4.2 ka. According to Smith et al. (2016), this noticeable arid interval is synchronous with large-scale North Atlantic cooling and an indicator of extending the spatial influence of the above-mentioned 4.2 ka megadrought to the Western Mediterranean or indeed into the Atlantic sector of the Iberian Peninsula. In southern Spain, another speleothem record reveals a micro-hiatus at 4.16 ka that might correspond to the 4.2 ka climatic event (Walczak et al., 2015). These findings are supported by a pollen record from the Doñana National Park in southwestern Spain that indicates a multi-centennial aridification trend centred at 4.0 ka cal BP (Jiménez-Moreno et al., 2015). Furthermore, a speleothem record from Gueldaman Cave in northern Algeria reveals a multi-centennial dry phase in Western Mediterranean northern Africa that started around 4.4 ka and was synchronous with the abandonment of the cave (Ruan et al., 2016). However, δ18O and δ13C records of an adjacent speleothem at Gueldaman Cave do not show the same pattern, and speleothem hydrochemistry might also reflect local factors. In contrast to the authors above, Cruz et al. (2015) assume a centennial-scale wet period at 4.2 ka from the Kaite Cave stalagmite record in Cantabrian Mountains of northern Spain. Further, there is evidence of increased storm activity in the Mediterranean Basin between 4.4 and 4.0 ka cal BP (Sabatier et al., 2012; Kaniewski et al., 2016; Marriner et al., 2017; Bini et al., 2018) that might indicate an enhanced incursion of humid air masses from the North Atlantic at that time. According to our interpretation of Sidi Ali δ18O values (Fig. 3d) and corresponding ice-rafted debris signals (Fig. 3c), a centennial-scale interval of cool and wet conditions (pale blue bar in Fig. 3) represents the 4.2 ka climatic event in the Middle Atlas. We point out that the Sidi Ali 14C age model of the 4.2 ka cal BP core section is based on two terrestrial plant residues (Fig. 3e, Fletcher et al., 2017) excluding potential age uncertainties due to hard water effects. Overall, this cool and wet interval fits into the in-phase hydro-climatic alternation of “cool and wet” and “warm and dry” conditions during the last 5000 years in the Western Mediterranean (pale blue bars in Fig. 3). Therefore, the Sidi Ali record shows no dry event and no out-of-phase climatic anomaly but increased humidity at 4.2 ka cal BP simultaneous with North Atlantic cooling. During the Early Holocene millennial-scale Sidi Ali winter rain minima are parallel to North Atlantic Bond events 8 to 4 (orange bars in Fig. 3). 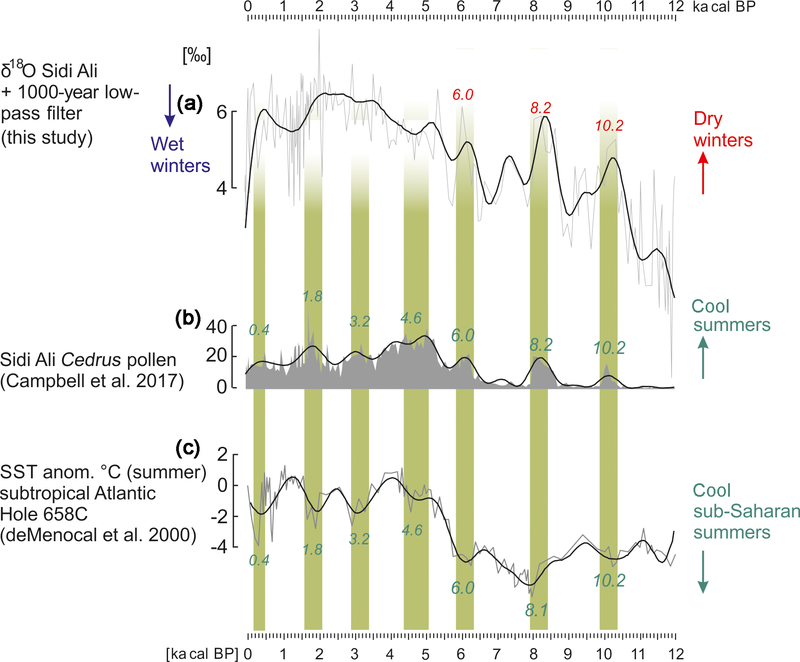 Sidi Ali winter rain minima correspond to pollen-derived dry events in the Western Mediterranean lowlands (Fletcher et al., 2013), indicating a noticeable teleconnection between Western Mediterranean decreases in rainfall and North Atlantic cooling. Here, cooling over the North Atlantic was probably associated with a northward shift of Atlantic cyclone trajectories, leading to increased drought in the Western Mediterranean and northern Africa (Zielhofer et al., 2017a). According to Bond et al. (2001) and Fletcher et al. (2013), North Atlantic cooling episodes and ice-rafted debris events result from millennial-scale weakening of the Atlantic Meridional Overturning Circulation (AMOC). Two of these “cold relapses” (Wanner et al., 2011) correspond to prominent freshwater outbursts from the Laurentide ice sheet at 9.3 and 8.2 ka cal BP (Alley and Ágústsdóttir, 2005; Fleitmann et al., 2008), indicating evidence of an AMOC pattern during the deglaciation (Fletcher et al., 2013; Wassenburg et al., 2016) that is comparable with glacial conditions (Rahmsdorf, 2002; Moreno et al., 2005). 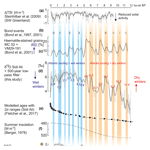 The Early Holocene periodicity of 900 to 1000 years in North Atlantic temperature changes and Western Mediterranean humidity is a widespread phenomenon in other palaeoclimatic records (Zhao et al., 2010; Cléroux et al., 2012; Fletcher et al., 2013, Ramos-Romána et al., 2018), providing coherence with the eddy frequency band of total solar irradiance (Steinhilber et al., 2009). Atlantic winter cyclones and Western Mediterranean lows during spring control the present rainfall regime at Lake Sidi Ali in the Middle Atlas (Knippertz et al., 2003). Especially during the winter season, cool and wet air masses of the North Atlantic westerly circulation dominate the present hydro-climate in the Western Mediterranean Basin (Born et al., 2010). Currently, the NAO significantly affects the amount of winter rainfall in the Western Mediterranean Basin with increases in winter rainfall under negative NAO indices (Hurrell et al., 2003). Likewise, there are multiple indications that the NAO represents a major forcing mechanism for past hydro-climatic changes in the Western Mediterranean. Both instrumental (Dünkeloh and Jacobeit, 2003; Deininger et al., 2017) and also Late Holocene data (Magny et al., 2003; Baker et al., 2015; Corella et al., 2016; Wassenburg et al., 2016; Di Rita et al., 2018a, b) provide evidence of spatio-temporal coherency in the European precipitation pattern. Here, negative NAO indices correspond to increased effective winter rainfall in the southwestern Mediterranean and with decreased humidity in the southern central Mediterranean and in Scandinavia. Following multiple authors (Trouet et al., 2009; Wassenburg et al., 2013), one of the most prominent negative NAO stages during the last 1000 years occurred during the Little Ice Age. The Sidi Ali δ18O winter rain curve (Fig. 3d) shows similarities with a lake sediment record from southwestern Greenland (Fig. 3g; Olsen et al., 2012) that represents an NAO reconstruction over the past 5200 years. Here, low NAO stages of the filtered Olsen record around 4.2, 3.3, 2.7 and 2.1 ka cal BP and during the Little Ice Age correspond to winter rain peaks at Sidi Ali. In this context, Late Holocene North Atlantic cooling and associated winter rain maxima (blue bars in Fig. 3) might reflect coupled atmosphere–ocean variability including subtropical gyre strength changes (Morley et al., 2011; Jalali et al., 2018) that are paced by solar minima (Moffa-Sánchez et al., 2014). Here, Western Mediterranean winter rain maxima (Fig. 3d) coincide with multiple centennial-scale solar minima during the Late Holocene (Fig. 3a). This might be comparable with the present NAO pattern that features primarily negative NAO indices during reduced solar irradiance (Matthes, 2011). However, multi-centennial-scale shifts in Western Mediterranean hydro-climate and North Atlantic hydrography also show spatial differences that do not correspond to current NAO pattern: the International Ice Patrol's counts of icebergs crossing 48∘ N in a southern direction are noticeably increased during positive indices of the NAO (Andrews, 2000; USCG, 2016). In this context, present iceberg variability is predominantly caused by fluctuation in Greenland ice sheet calving discharge rather than open-ocean iceberg melting (Bigg et al., 2014). This does not correspond to the pairing of Bond's maxima in ice-rafted debris and Sidi Ali winter rain maxima that would reflect negative NAO-like indices during the Late Holocene. Furthermore, Late Holocene ice-rafted debris records from multiple North Atlantic marine cores (Bond et al., 2001) reveal synchronous iceberg advances off Newfoundland, off Ireland and off Iceland. Bond's comparison with secondary palaeoclimatic records from the North Atlantic realm indicates that multi-centennial ice-rafted debris events correspond to cooling phases in the entire region. This is not in accordance with the typical negative-NAO temperature pattern that shows subregional temperature increases in the subpolar North Atlantic (Bond et al., 2001). Spatially synchronous events of Holocene ice-rafted debris can be more typical for a reduced North Atlantic Deep Water formation (Moffa-Sánchez and Hall, 2018). In this context, the palaeoceanographic evidence of large-scale synchronous Holocene cooling events in the subpolar North Atlantic was recently verified by modelling results (Liu et al., 2017): a reduction in the AMOC corresponds to a widespread cooling over the northern North Atlantic and a noticeable sea ice expansion over the Greenland–Iceland–Norwegian seas. In summary, the following conclusions for Late Holocene Bond events and Western Mediterranean winter rain maxima result. The Late Holocene coincidence of Sidi Ali δ18O winter rain maxima and ice-rafted debris events does not show a strict spatial pattern and mechanisms of the present NAO. Rather, this centennial-scale pattern seems to be more typical for long-term AMOC variability with predominantly southward-shifted westerlies and synchronous iceberg advances during intervals of reduced AMOC (Deininger et al., 2017). Here, major Late Holocene cooling events and Western Mediterranean winter rain maxima might correspond to centennial-scale solar minima (Fig. 3a; Steinhilber et al., 2009). 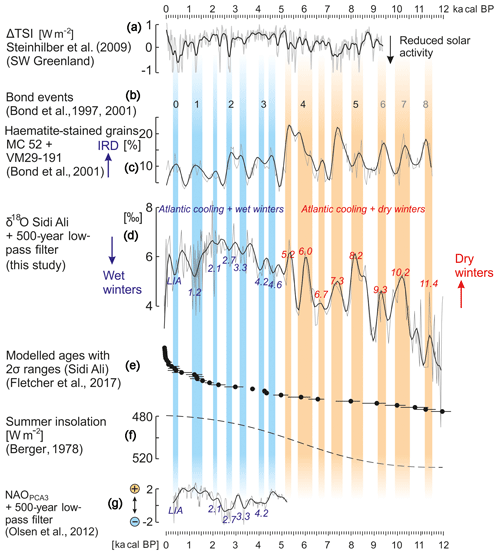 Therefore, available “NAO” reconstructions (Trouet et al., 2009; Olsen et al., 2012; Wassenburg et al., 2016) might reflect a more complex set of forcing mechanisms (ice rafting, AMOC, solar forcing, NAO), influencing decadal- to multi-centennial-scale changes in the North Atlantic hydro-climate during the past. Therefore, our improved Sidi Ali δ18O winter rain record does not represent a strict NAO reconstruction but a hydro-climatic response of multi-centennial to millennial shifts in North Atlantic hydrography. Overall, the noticeable match between the Sidi Ali δ18O and the ice-rafted debris records indicates a Holocene teleconnection between the subpolar North Atlantic and the Western Mediterranean hydro-climate but with a noticeable change in large-scale ocean–atmosphere coupled climatic mechanisms at ∼5 ka cal BP. In contrast, some palaeoclimatic studies from the east of the Iberian Peninsula (Pélachs et al., 2011; Smith et al., 2016) but also from the Alpine region (Mangini et al., 2007; Fohlmeister et al., 2012) postulate consistent oceanic–atmospheric interactions between the subpolar North Atlantic and western Europe for the entire Holocene with reference to Bond's ice-rafted debris record. However, high-resolution speleothem records from southern Spain (Walczak et al., 2015) and the Middle Atlas (Wassenburg et al., 2016), Tunisian alluvial records (Zielhofer and Faust, 2008), and an Alboran Sea pollen record (Fletcher et al., 2013) provide indications of a large-scale hydro-climatic shift in the North Atlantic–Western Mediterranean region during the Middle Holocene. This Middle Holocene shift in Western Mediterranean hydro-climate is visible in significant frequency changes in humidity at multi-centennial timescales but also at an orbital scale. There is evidence of Early Holocene humidity and Late Holocene aridity in Mediterranean Morocco (Ibouhouten et al., 2010; Limondin-Lozouet et al., 2013), in the central Mediterranean domains of northern Africa (Bosmans et al., 2015; Wu et al., 2017) and in the Levant (Migowski et al., 2006; Zielhofer et al., 2018a). Increased Early Holocene rainfall in the Mediterranean Basin corresponds to the African Humid Period in the northern African monsoon domain (Bosmans et al., 2015; Shanahan et al., 2015) and reduced Saharan dust supply (Ehrmann et al., 2017; Zielhofer et al., 2017b). The Middle Holocene southward shift of the Intertropical Convergence Zone (ITCZ) corresponds to a weakening and northward shift of the Atlantic winter storm tracks (Black et al., 2011; Kutzbach et al., 2014) and led to enduring drier winters in the Mediterranean Basin during the Late Holocene. Lake Sidi Ali is situated in the subhumid Middle Atlas Mountains of Morocco. Currently, the local hydro-climate is under strong influence of the NAO, which provides enhanced effective rainfall under negative NAO indices. Previous palaeolimnological and palaeoclimatological studies indicate that the Middle Atlas represents a key region for Holocene hydro-climatic variability in the Western Mediterranean. In this study, we present an improved Holocene δ18O record of Sidi Ali ostracod shell material to enhance the chronological resolution of a previous record from the same core. The new data set provides a mean chronological resolution of 71.4 years. The comparison of the Sidi Ali δ18O record with a Cedrus record from the same core (Campbell et al., 2017) shows enhanced winter precipitation (low δ18O) and enhanced summer heat (low Cedrus pollen concentrations) at an orbital scale during the Early Holocene and reduced winter precipitation (high δ18O) and cool summer conditions (high concentration of Cedrus pollen) during the Late Holocene (Fig. 4). At a millennial scale the Sidi Ali δ18O and the Cedrus records are in-phase at 10.2, 8.2 and 6.0 ka cal BP, but there are also indications of out-of-phase patterns (e.g. at 9.3 and 7.3 ka and during the Late Holocene) (Fig. 4). We argue that this out-of-phase pattern might be influenced by different forcing mechanisms for summer cooling (subtropical high) and winter rain (North Atlantic winter cyclones). 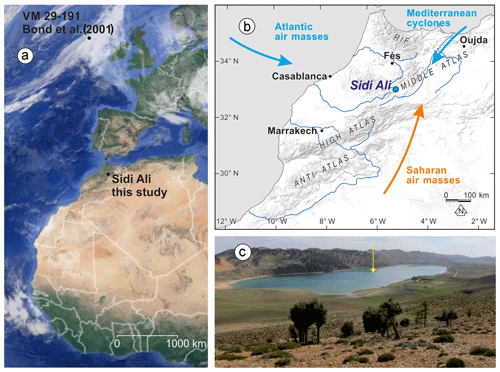 Figure 4Holocene Lake Sidi Ali record: major conclusions of this study. Centennial- to millennial-scale peaks in the Sidi Ali δ18O record represent intervals of Western Mediterranean winter rain minima. 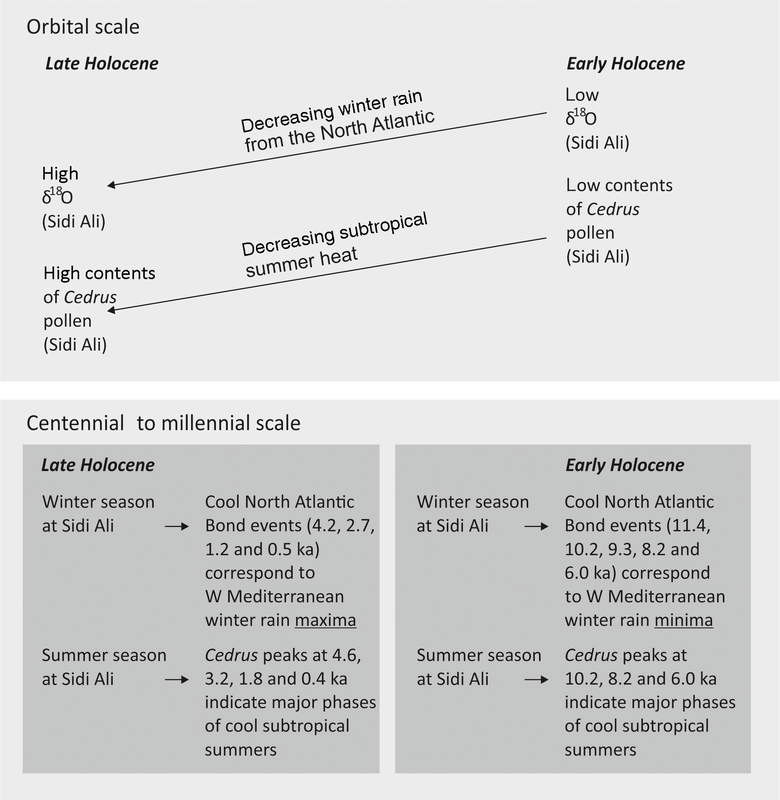 The comparison of the Sidi Ali δ18O record with the stacked ice-rafted debris record (Bond et al., 2001) from the subpolar North Atlantic indicates a positive coupling during the Early Holocene and an opposite pattern during the Late Holocene. Early Holocene Bond events and North Atlantic cooling are parallel to arid conditions in the Western Mediterranean (Fig. 4), whereas during the last 5000 years Bond events correspond to wet hydro-climates (Fig. 4). In the Early Holocene, at least two Bond events at 9.3 and 8.2 ka cal BP coincide with prominent freshwater outbursts from the Laurentide ice sheet. Centennial-scale hydro-climatic anomalies show similarities with NAO pattern during the Late Holocene. However, our Sidi Ali δ18O record does not represent a strict NAO reconstruction but rather a hydro-climatic response of multi-centennial shifts in North Atlantic hydrography. Here, solar minima, iceberg advances, subtropical gyre strength changes and a reduced AMOC represent drivers of a coupled North Atlantic ocean–atmosphere system with multi-centennial intervals of Western Mediterranean winter rain maxima during the last 5000 years. Focusing on the 4.2 ka climatic event that is a major subject of this Climate of the Past special issue, the data show a cool and wet interval around 4.2 ka cal BP. This is overall in-phase with centennial-scale climatic shifts from cool and wet towards warm and dry hydro-climates during the last 5000 years in the Western Mediterranean. The Sidi Ali stable isotope dataset is available online at https://doi.org/10.13140/RG.2.2.27630.25920 (Zielhofer et al., 2019). The supplement related to this article is available online at: https://doi.org/10.5194/cp-15-463-2019-supplement. CZ and WF designed the study; CZ and AK wrote a first draft of the paper; CZ and AK performed the statistical analyses and undertook the ostracod sampling; SM supervised the ostracod sampling procedure; CZ, AK, SM, AB, AM and WF contributed to discussion and revision of the paper. This article is part of the special issue “The 4.2 ka BP climatic event”. It is a result of “The 4.2 ka BP Event: An International Workshop”, Pisa, Italy, 10–12 January 2018. Christoph Zielhofer, Steffen Mischke and William Fletcher as principal investigators thank the German Research Foundation (DFG, ZI 721/9-1), the Federal Ministry of Education and Research (BMBF, 01DH17020) and the Natural Environment Research Council (New Investigator Award to William J. Fletcher, NE/K000608/1, and NERC RCF dating awards 1765.1013 and 1809.0414) for generous funding of the fieldwork and lab analyses. The authors are grateful to the Institut National des Sciences de l'Archéologie et du Patrimoine (INSAP, Rabat), the Centre National d'Hydrobiologie et de Pisciculture (CNHP, Azrou) and to the Caidad d'Azrou for helpful support in the field and in preparing the expedition. Stefan Krüger and Thomas Brachert (Institute for Geophysics and Geology, Leipzig University) are greatly acknowledged for conducting oxygen stable isotope data analyses. This paper was edited by Raymond Bradley and reviewed by two anonymous referees. Alley, R. B. and Ágústsdóttir, A. M.: The 8k event: Cause and consequences of a major Holocene abrupt climate change, Quaternary Sci. Rev., 24, 1123–1149, 2005. Andrews, J. T.: Icebergs and iceberg rafted detritus (IRD) in the North Atlantic: facts and assumptions, Oceanography, 13, 100–108, 2000. Baker, A., Hellstrom, C., Kelly, B. F., Mariethoz, G., and Trouet, V.: A composite annual-resolution stalagmite record of North Atlantic climate over the last three millennia, Sci. Rep., 5, 10307, 2015. Benito, G., Thorndycraft, V. R., Rico, M., Sánchez-Moya, Y., and Sopeña, A.: Palaeoflood and floodplain records from Spain: Evidence for long-term climate variability and environmental changes, Geomorphology, 101, 68–77, 2008. Benito, G., Macklin, M. G., Zielhofer, C., Jones, A., and Machado, M. J.: Holocene flooding and climate change in the Mediterranean, Catena, 130, 13–33, 2015a. Benito, G., Macklin, M. G., Panin, A., Rossato, S., Fontana, A., Jones, A. F., Machado, M. J., Matlakhova, E., Mozzi, P., and Zielhofer, C.: Recurring flood distribution patterns related to short-term Holocene climatic variability, Sci. Rep., 5, 16398, https://doi.org/10.1038/srep16398, 2015b. Benkaddour, A., Lamb, H., Leng, M., and Gasse, F.: Stable Isotope Records of Holocene Environmental Change from Moroccan Lakes: an Emerging Synthesis, http://www.pages.unibe.ch/download/docs/meeting-products/posters/2005-osm2/Benkaddour-A.pdf (last access: 15 March 2019), 2005. Berger, A.: Long-term variations of caloric insolation resulting from the earth's orbital elements, Quaternary Res., 9, 139–167, 1978. Bigg, G. R., Wei, H. L., Wilton, D. J., Zhao, Y., Billings, S. A., Hanna, E., and Kadirkamanathan, V.: A century of variation in the dependence of Greenland iceberg calving on ice sheet surface mass balance and regional climate change, Proc. Math. Phys. Eng. Sci., 470, 20130662, https://doi.org/10.1098/rspa.2013.0662, 2014. Black, E., Brayshaw, D., Black, S., and Rambeau, C.: Using proxy data, historical climate data and climate models to investigate aridification during the Holocene, in: Water, Life and Civilisation, edited by: Mithen, S. and Black, E., Cambridge University Press, Cambridge, 105–112, 2011. Born, K., Fink, A. H., and Knippertz, P.: Meteorological processes influencing the weather and climate of Morocco, in: Impacts of Global Change on the Hydrological Cycle in West and Northwest Africa, edited by: Speth, P., Christoph, M., and Diekkrüger, B., 150–163, Springer, 2010. Bosmans, J. H. C., Drijfhout, S. S., Tuenter, E., Hilgen, F. J., Lourens, L. J., and Rohling, E. J.: Precession and obliquity forcing of the freshwater budget over the Mediterranean, Quaternary Sci. Rev., 123, 16–30, 2015. Bradley, R. and Bakke, J.: Is there evidence for a 4.2 ka BP event in the northern North Atlantic region?, Clim. Past Discuss., https://doi.org/10.5194/cp-2018-162, in review, 2019. Bügelmayer-Blaschek, M., Roche, D. M., Renssen, H., and Andrews, J. T.: Internal ice-sheet variability as source for the multi-century and millennial-scale iceberg events during the Holocene? A model study, Quaternary Sci. Rev., 138, 119–130, 2016. Campbell, J. F. E., Fletcher, W. J., Joannin, S., Hughes, P., Rhanem, M., and Zielhofer, C.: Environmental drivers of Holocene forest development in the Middle Atlas, Morocco, Front. Ecol. Evol., 5, 113, https://doi.org/10.3389/fevo.2017.00113, 2017. Català, A., Cacho, I., Frigola, J., Pena, L. D., and Lirer, F.: Holocene hydrography evolution in the Alboran Sea: a multi-record and multiproxy comparison, Clim. Past Discuss., https://doi.org/10.5194/cp-2018-163, in review, 2018. Cheng, H., Sinha, A., Verheyden, S., Nader, F. H., Li, X. L., Zhang, P. Z., Yin, J. J., Yi, L., Peng, Y. B., Rao, Z. G., Ning, Y. F., and Edwards, R. L.: The climate variability in northern Levant over the past 20,000 years, Geophys. Res. Lett., 42, 8641–8650, 2015. Cléroux, C., Debret, M., Cortijo, E., Duplessy, J. C., Dewilde, F., Reijmer, J., and Massei, N.: High-resolution sea surface reconstructions off Cape Hatteras over the last 10 ka, Paleoceanography, 27, PA1205, https://doi.org/10.1029/2011PA002184, 2012. Corella, J. P., Valero-Garcés, B. L., Vicente-Serrano, S. M., Brauer, A., and Benito, G.: Three millennia of heavy rainfalls in Western Mediterranean: frequency, seasonality and atmospheric drivers, Sci. Rep., 6, 38206, https://doi.org/10.1038/srep38206, 2016. Cruz, J. A., Turrero, M. J., Cáceres, J. O., Marín-Roldán, A., Ortega, A. I., Garralón, A., Sánchez, L., Gómez, P., Muñoz-García, M. B., Edwards, R. L., and Martín-Chivelet, J.: Long-term hydrological changes in northern Iberia (4.9–0.9 ky BP) from speleothem Mg/Ca ratios and cave monitoring (Ojo Guareña Karst Complex, Spain), Environ. Earth. Sci., 74, 7741–7753, 2015. Darby, D. A., Ortiz, J. D., Grosch, C. E., and Lund, S. D.: 1,500-year cycle in the Arctic Oscillation identified in Holocene Arctic sea-ice drift, Nat. Geosci., 5, 897–900, https://doi.org/10.1038/ngeo1629, 2012. Deininger, M., McDermott, F., Mudelsee, M., Werner, M., Frank, N., and Mangini, A.: Coherency of late Holocene European speleothem δ18O records linked to North Atlantic Ocean circulation, Clim. Dynam., 49, 595–618, 2017.
deMenocal, P. B., Ortiz, J., Guilderson, T., and Sarnthein, M.: Coherent high- and low-latitude climate variability during the Holocene warm period, Science, 288, 2198–2202, 2000. Di Rita, F. and Magri, D.: The 4.2 ka event in the vegetation record of the central Mediterranean, Clim. Past, 15, 237–251, https://doi.org/10.5194/cp-15-237-2019, 2019. Di Rita, F., Lirer, F., Bonomo, S., Cascella, A., Ferraro, L., Florindo, F., Insinga, D. D., Lurcock, P. C., Margaritelli, G., Petrosino, P., Rettori, R., Vallefuoco, M., and Magri, D.: Late Holocene forest dynamics in the Gulf of Gaeta (central Mediterranean) in relation to NAO variability and human impact, Quaternary Sci. Rev., 179, 137–152, 2018a. Di Rita, F., Fletcher, W. J., Aranbarri, J., Margaritelli, G., Lirer, F., and Magri, D.: Holocene forest dynamics in central and western Mediterranean: periodicity, spatio-temporal patterns and climate influence, Sci. Rep., 8, 8929, doi10.1038/s41598-018-27056-2, 2018b. Dünkeloh, A. and Jacobeit, J.: Circulation dynamics of Mediterranean precipitation variability 1948–1998, Int. J. Climatol., 23, 1843–1866, 2003. Ehrmann, W., Schmiedl, G., Beuscher, S., and Krüger, S.: Intensity of African Humid Periods Estimated from Saharan Dust Fluxes, PLOS ONE, 12, e0170989, https://doi.org/10.1371/journal.pone.0170989, 2017. Faust, D. and Wolf, D.: Interpreting drivers of change in fluvial archives of the Western Mediterranean – A critical view, Earth Sci. Rev., 174, 53–83, 2017. Faust, D., Zielhofer, C., Baena, R., and Diaz del Olmo, F.: High-resolution fluvial record of late Holocene geomorphic changes in Northern Tunisia: Climatic or human impact?, Quaternary Sci. Rev., 23, 1757–1775, 2004. Fleitmann, D., Mudelsee, M., Burns, S. J., Bradley, R. S., Kramers, J., and Matter, A.: Evidence for a widespread climatic anomaly at around 9.2 ka before present, Paleoceanography, 23, PA1102, https://doi.org/10.1029/2007PA001519, 2008. Fletcher, W. J., Debret, M., and Sanchez Goñi, M. F.: Mid-Holocene emergence of a low-frequency millennial oscillation in western Mediterranean climate: implications for past dynamics of the North Atlantic atmospheric westerlies, Holocene, 23, 153–166, 2013. Fletcher, W. J., Zielhofer, C., Mischke, S., Bryant, C., Xu, X., and Fink, D.: AMS radiocarbon dating of pollen concentrates in a karstic lake system, Quat. Geochronol., 39, 112–123, 2017. Fohlmeister, J., Vollweiler, N., Spötl, C., and Mangini, A.: COMNISPA II: Update of a mid-European isotope climate record, 11 ka to present, Holocene, 23, 749–754, 2012. Google scholar: Persistent solar influence on North Atlantic climate during the Holocene by Bond et al. (2001), https://scholar.google.de/scholar?hl=de&as_sdt=0\%2C5&q=Persistent+solar+influence+on+North+Atlantic+climate+during+the+Holocene&btnG, last access: 15 February 2019. Hurrell, J. W., Kushnir, Y., Ottersen, G., and Visbeck, M.: An overview of the North Atlantic oscillation, in: The North Atlantic Oscillation: Climatic Significance and Environmental Impact, Geophysical Monograph Series, edited by: Hurrell, J. W., Kushnir, Y., Ottersen, G., and Visbeck, M., American Geophysical Union, Washington, 134, 1–35, https://doi.org/10.1029/134GM01, 2003. Ibouhouten, H., Zielhofer, C., Mahjoubi, R., Kamel, S., Linstädter, J., Mikdad A., Bussmann, J., Werner, P., and Fenech, K.: Archives alluviales holocènes et occupation humaine en Basse Moulouya (Maroc nord-oriental), Géomorphologie, 16, 41–56, 2010. Jalali, B., Sicre, M.-A., Azuara, J., Pellichero, V., and Combourieu-Nebout, N.: Influence of the North Atlantic subpolar gyre circulation on the 4.2 ka BP event, Clim. Past Discuss., https://doi.org/10.5194/cp-2018-159, in review, 2018. Jiménez-Moreno, G., Rodríguez-Ramírez, A., Pérez-Asensio, J. N., Carrión, J. S., López-Sáez, J. A., Villarías-Robles, J. J. R., Celestino-Pérez, S., Cerrillo-Cuenca, E., León, A., and Contreras, C.: Impact of late-Holocene aridification trend, climate variability and geodynamic control on the environment from a coastal area in SW Spain, Holocene, 25, 607–617, 2015. Kaniewski, D., Marriner, N., Morhange, C., Faivre, S., Otto, T., and Van Campo, E.: Solar pacing of storm surges, coastal flooding and agricultural losses in the Central Mediterranean, Sci. Rep., 6, 25197, https://doi.org/10.1038/srep25197, 2016. Knippertz, P., Christoph, M., and Speth, P.: Long-term precipitation variability in Morocco and the link to the large-scale circulation in recent and future climates, Meteorol. Atmos. Phys., 83, 67–88, 2003. Kutzbach, J. E., Chen, G., Cheng, H., Edwards, R. L., and Liu, Z.: Potential role of winter rainfall in explaining increased moisture in the Mediterranean and Middle East during periods of maximum orbitally-forced insolation seasonality, Clim. Dynam., 42, 1079–1095, 2014. Limondin-Lozouet, N., Haddoumi, H., Lefèvre, D., Ghamizi, M., Aouraghe, H., and Salel, T.: Holocene molluscan succession from NE Morocco: Palaeoenvironmental reconstruction and biogeographical implications, Quatern. Int., 302, 61–76, 2013. Linstädter, J.: Climate Induced Mobility and the Missing Middle Neolithic of Morocco, in: Palaeoenvironment and the Development of Early Settlements. Menschen – Kulturen – Traditionen (ForschungsCluster 1), edited by: Reindel, M., Bartl, K., Lüth, F., and Benecke, N., 14, 63–80, 2016. Liu, W., Xie, S. P., Liu, Z., and Zhu, J.: Overlooked possibility of a collapsed Atlantic Meridional Overturning Circulation in warming climate, Sci. Adv., 3, e1601666, https://doi.org/10.1126/sciadv.1601666, 2017. Mangini, A., Verdes, P., Spötl, C., Scholz, D., Vollweiler, N., and Kromer, B.: Persistent influence of the North Atlantic hydrography on central European winter temperature during the last 9000 years, Geophys. Res. Lett., 34, L02704, https://doi.org/10.1029/2006GL028600, 2007. Margaritelli, G., Vallefuoco, M., Di Rita, F., Capotondi, L., Bellucci, L. G., Insinga, D. D., Petrosino, P., Bonomo, S., Cacho, I., Cascella, A., Ferraro, L., Florindo, F., Lubritto, C., Lurcock, P. C., Magri, D., Pelosi, N., Rettori, R., and Lirer, F.: Marine response to climate changes during the last five millennia in the central Mediterranean Sea, Glob. Planet. Change, 142, 53–72, 2016. Marriner, N., Kaniewski, D., Morhange, C., Flaux, F., Giaime, M., Vacchi, M., and Goff, J.: Tsunamis in the geological record: making waves with a cautionary tale from the Mediterranean, Sci. Adv., 3, e1700485, https://doi.org/10.1126/sciadv.1700485, 2017. Matthes, K.: Atmospheric science: solar cycle and climate predictions, Nat. Geosci., 4, 735–736, 2011. Migowski, C., Stein, M., Prasad, S., Negendank, J. F. W., and Agnon, A.: Holocene climate variability and cultural evolution in the Near East from the Dead Sea sedimentary record, Quaternary Res., 66, 421–431, 2006. Moffa-Sánchez, P. and Hall, I. R.: North Atlantic variability and its links to European climate over the last 3000 years, Nat. Commun., 8, 1726, https://doi.org/10.1038/s41467-017-01884-8, 2018. 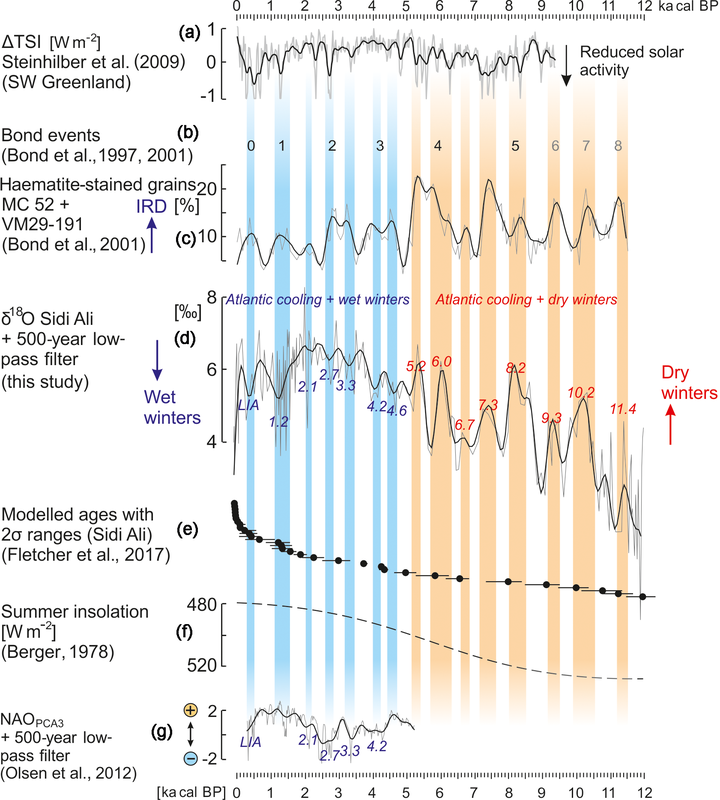 Moffa-Sánchez, P., Born, A., Hall, I. R., Thornalley, D. J., and Barker, S.: Solar forcing of North Atlantic surface temperature and salinity over the past millennium, Nat. Geosci., 7, 275–278, 2014. Morellón, M., Aranbarri, J., Moreno, A., González-Sampériz, P., and Valero-Garcés, B. L.: Early Holocene humidity patterns in the Iberian Peninsula reconstructed from lake, pollen and speleothem records, Quaternary Sci. Rev., 181, 1–18, 2018. Moreno, A., Cacho, I., Canals, M., Grimalt, J. O., Sánchez-Goñi, M. F., Shackleton, N., and Sierro, F. J.: Links between marine and atmospheric processes oscillating on a millennial time-scale. A multi-proxy study of the last 50,000 yr from the Alboran Sea (Western Mediterranean Sea), Quaternary Sci. Rev., 24, 1623–1636, 2005. 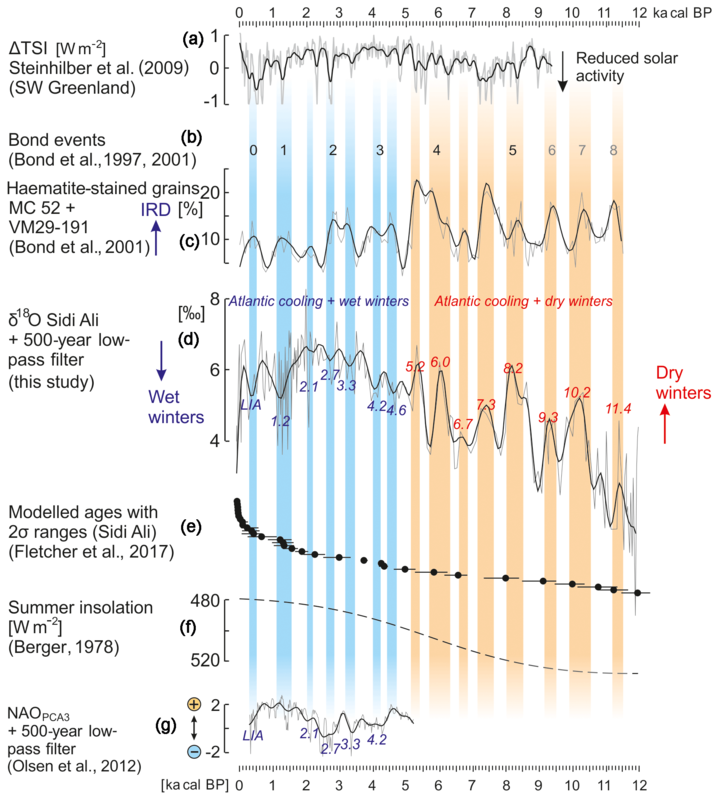 Morley, A., Schulz, M., Rosenthal, Y., Mulitza, S., Paul, A., and Rühlemann, C.: Solar modulation of North Atlantic central Water formation at multidecadal timescales during the late Holocene, Earth Planet. Sc. Lett., 308, 161–171, 2011. Obrochta, S. P., Miyahara, H., Yokoyama, Y., and Crowley, T. J.: A re-examination of evidence for the North Atlantic “1500-year cycle” at Site 609, Quaternary Sci. Rev., 55, 23–33, 2012. Olsen, J., Anderson, J., and Knudsen, M. F.: Variability of the North Atlantic Oscillation over the past 5,200 years, Nat. Geosci., 5, 808–812, 2012. Pélachs, A., Julià, R., Pérez-Obiol, R., Soriano, J. M., Bal, M. C., Cunill, R., and Catalan, J.: Potential influence of Bond events on mid-Holocene climate and vegetation in southern Pyrenees as assessed from Burg lake LOI and pollen records, Holocene, 21, 95–104, 2011. Rahmsdorf, S.: Ocean circulation and climate during the past 120,000 years, Nature, 419, 207–214, 2002. Ramos-Romána, M. J., Jiménez-Moreno, G., Camuera, J., García-Alix, A., Scott Anderson, R., Jiménez-Espejo, F. J., Sachse, D., Toney, J. L., Carrión, J. S., Webster, C., and Yanes, Y.: Millennial-scale cyclical environment and climate variability during the Holocene in the western Mediterranean region deduced from a new multiproxy analysis from the Padul record (Sierra Nevada, Spain), Glob. Planet. Change, 168, 35–53, 2018. Sabatier, P., Dezileau, L., Colin, C., Briqueu, L., Bouchette, F., Martinez, P., Siani, G., Raynal, O., and Von Grafenstein, U.: 7000 years of paleostorm activity in the NW Mediterranean Sea in response to Holocene climate events, Quaternary Res., 77, 1–11, 2012. Samartin, S., Heiri, O., Joos, F., Renssen, H., Franke, J., Brönnimann, S., and Tinner, W.: Warm Mediterranean mid-Holocene summers inferred from fossil midge assemblages, Nat. Geosci., 10, 207–212, 2017. Sayad, A., Chakiri, S., Martin, C., Bejjaji, Z., and Echarfaoui, H.: Effet des conditions climatiques sur le niveau du lac Sidi Ali (Moyen Atlas, Maroc), Physio-Géo, 5, 251–268, 2011. Sejrup, H. P., Haflidason, H., and Andrews, J. T.: A Holocene North Atlantic SST record and regional climate variability, Quaternary Sci. Rev., 30, 3181–3195, 2011. Steinhilber, F., Beer, F., and Frohlich, C.: Total solar irradiance during the Holocene, Geophys. Res. Lett., 36, L19704, https://doi.org/10.1029/2009GL040142, 2009. United States Coast Guards (USCG): Navigation Center – Iceberg locations, available at: https://www.navcen.uscg.gov/?pageName=IcebergLocations (last access: 27 July 2017), 2016.
von Grafenstein, U., Erlenkeuser, H., and Trimborn, P.: Oxygen and carbon isotopes in modern fresh-water ostracod valves: assessing vital offsets and autoecological effects of interest for palaeoclimate studies, Palaeogeogr. Palaeocl., 148, 133–152, 1999. Wassenburg, J. A., Immenhauser, A., Richter, D. K., Niedermayr, A., Riechelmann, S., Fietzke, J., Scholz, D., Jochum, K. P., Fohlmeister, J., Schroder-Ritzrau, A., Sabaoui, A., Riechelmann, D. F. C., Schneider, L., and Esper, J.: Moroccan speleothem and tree ring records suggest a variable positive state of the North Atlantic Oscillation during the Medieval Warm Period, Earth Planet. Sc. Lett., 375, 291–302, 2013. Wassenburg, J. 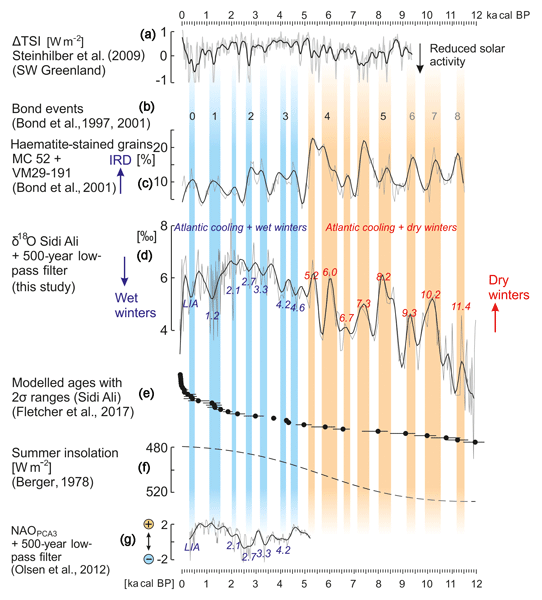 A., Dietrich, S., Fietzke, J., Fohlmeister, J., Jochum, K. P., Scholz, D., Richter, D. K., Sabaoui, A., Spötl, C., Lohmann, G., Andreae, M. O., and Immenhauser, A.: Reorganization of the North Atlantic Oscillation during early Holocene deglaciation, Nat. Geosci., 9, 602–607, 2016. Weiss, H.: Global megadrought, societal collapse and resilience at 4.2–3.9 ka BP across the Mediterranean and west Asia, Pages Magazine, 24, 62–63, 2016. Wolf, D., Seim, A., Diaz del Olmo, F., and Faust, D.: Late Quaternary fluvial dynamics of the Jarama River in central Spain, Quaternary Int., 302, 20–41, 2013. Wu, J., Liu, Z., Stuut, J. B. W., Zhao, Y., Schirone, A., and de Lange, G. J.: North-African paleodrainage discharges to the central Mediterranean during the last 18,000 years: A multiproxy characterization, Quaternary Sci. Rev., 163, 95–113, 2017. Zanchetta, G., Regattieri, E., Isola, I., Drysdale, R. N., Bini, M., Baneschi, I., and Hellstrom, J. C.: The so-called “4.2 event” in the Central Mediterranean and its climatic teleconnections, Alp. Med. Quat., 29, 5–17, 2016. Zhao, C., Yu, Z., Ito, E., and Zhao, Y.: Holocene climate trend, variability, and shift documented by lacustrine stable-isotope record in the northeastern United States, Quaternary Sci. Rev., 29, 1831–1843, 2010. Zielhofer, C., Faust, D., and Linstädter, J.: Late Pleistocene and Holocene fluvial records in the Western Mediterranean: hydroclimatical changes and past human response, Quatern. Int., 181, 39–54, 2008. Zielhofer, C., Bussmann, J., Ibouhouten, H., and Fenech, K.: Flood frequencies reveal Holocene Rapid Climate Changes (Lower Moulouya River, NE Morocco), J. Quat. Sci., 25, 700–714, 2010. Zielhofer, C., Fletcher, W. J., Mischke, S., De Batist, M., Campbell, J. F. E., Joannin, S., Tjallingii, R., El Hamouti, N., Junginger, A., Stele, A., Bussmann, J., Schneider, B., Lauer, T., Spitzer, K., Strumpler, M., Brachert, T., and Mikdad, A.: Atlantic forcing of Western Mediterranean winter rain minima during the last 12,000 years, Quaternary Sci. Rev., 157, 29–51, 2017a. Zielhofer, C., von Suchodoletz, H., Fletcher, W. J., Schneider, B., Dietze, E., Schlegel, M., Schepanski, K., Weninger, B., Mischke, S., and Mikdad, A.: Millennial-scale fluctuations in Saharan dust supply across the decline of the African Humid Period, Quaternary Sci. Rev., 171, 119–135, 2017b. Zielhofer, C., Wellbrock, K., al-Souliman, A. S., von Grafenstein, M., Schneider, B., Fitzsimmons, K., Stele, A., Lauer, T., von Suchodoletz, H., Al-Khilfa, H., Grottker, M., and Gebel, H. G. K.: Climate forcing and shifts in water management on the Northwest Arabian Peninsula (mid-Holocene Rasif wetlands, Saudi Arabia), Quaternary Int., 473, 120–140, 2018a. Zielhofer C., Köhler, A., Mischke, S., Benkaddour, A., Mikdad, A., and Fletcher, W. J.: Interactive comment on “Western Mediterranean hydro-climatic consequences of Holocene iceberg advances (Bond events)”. Clim. Past Discuss., https://doi.org/10.5194/cp-2018-97-AC1, 2018b. Zielhofer, C., Köhler, A., Mischke, S., Benkaddour, A., Mikdad, A., and Fletcher, W.: Sidi Ali d18O Zielhofer et al. 2019 Climate of the Past, https://doi.org/10.13140/RG.2.2.27630.25920, 2019.